One night I was scrolling through Instagram when I noticed I kept seeing the same ad for this hair color company. These ads promised salon results at a fraction of the price. It promised luxury, gray coverage, and even tones. Sounds too good to be true, right? This ad was for Madison Reed Hair Color. I’ve never heard of this brand before, but I noticed it was being advertised to me on nearly all of my social media platforms including Instagram, Facebook, and Pinterest. I have been coloring my own hair since I was 13. I’m naturally a blonde and have been coloring my hair dark. This past summer I dabbled with fashion colors as well, going from Rose Gold to Purple to Blue. Before I tried Madison Reed, I was sitting with some uneven chocolate brown color. I had gone roughly 5-6 weeks without touching up my hair, and my blonde roots were showing through. I went over my roots with my usual chocolate brown color, but they’re uneven and left me with some hot root action. Not cute! This post contains affiliate links, meaning if you choose to use these links to make a purchase, I earn a small commission (at no additional cost to you). Please note, that this post is not sponsored and I did try the product with my own money. When I logged onto their website, I was greeted with a color quiz. This in-depth quiz was very visual and easy to use. It asked me things like my hair texture, natural hair color, hair concerns (gray hair, frizziness, etc. ), if my hair was color treated or virgin, hair goal (root touch-up, full-coverage color), and what color I wanted to have my hair. Having done my hair for so long, I’m used to the convenience of shopping at Sally Beauty Supply or hopping over to my local CVS or Walgreens. Naturally, I wondered how long shipping takes from Madison Reed. Surprisingly enough, my order arrived really fast! I placed my order on a Tuesday, got shipping confirmation the next day, and it was in my mailbox on Thursday. I did not pay additional for quick shipping, either. In total, my order with shipping was $29.95. The product was $24.95 with a $5 shipping charge. The Madison Reed hair color kit comes with everything you need (and then some) to color your hair at home. The gloves felt really nice and came in a sleek black color with a matching cap. The color itself was very easy to mix and apply (just like the usual box dyes). My “Before” color was looking very blah. It was dull, brassy, and was uneven in some parts. Keep in mind, I took this photo right before coloring my hair with Madison Reed. I color my hair on unwashed, “dirty” hair. I typically wait about 2-3 days without washing my hair to color again. Coloring your hair on “dirty” or greasy hair helps to further protect your scalp and hair. Since coloring can strip your hair of the natural oils, why not give it that natural protection? For all-over color, I needed to leave in the cream for a total of 35 minutes (for stubborn grays, leave on an additional 10 minutes). Mixing the color was easy, and applying it wasn’t a pain. I have shoulder length hair (thanks to some bleaching… had to chop off my hair! ), so I didn’t need as much color. If you have longer hair, however, you will need two bottles. One thing I did notice was that the Madison Reed Hair Color did not smell like harsh chemicals. In fact, I hardly smelled it when I was applying the hair color. I wasn’t dying from chemical fumes in my bathroom in order to get colored hair! That was a major plus for me. Another plus was the stain removing wipe. I’m a mess – and coloring my hair is no different. I always end up getting a streak of color on my arm or shoulder while coloring my hair… so the wipe really helped me get those stains off quickly! Plus, it had a very pleasant, clean smell to it. Once 35 minutes was up, it was time to rinse. They provide a second pair of gloves to wear while you rinse your hair. About halfway through, I decided to ditch the gloves and proceeded to rinse my hair with bare hands. Once the water ran clear, I gave my hair a little wash with a dollop of the shampoo they provided, followed by the conditioner. I think I have found my new favorite hair color line! Madison Reed gave me such a beautiful color result. The color is very rich and left my hair feeling so incredibly soft. 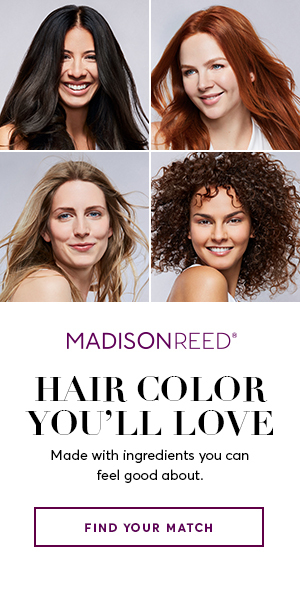 I highly recommend Madison Reed if you’re looking for great results, nourished hair, and great color payoff. My hair looks and feels healthy and I am extremely impressed with the color! SPECIAL DISCOUNT FOR SOVERYME READERS! I reached out to Madison Reed to ask about a discount code for my readers – and they hooked us up! Get 10% OFF your order plus FREE SHIPPING when you use the code “MARISSA18” at checkout! Since writing this post, they have been my go-to hair color – I highly recommend them! Have you tried Madison Reed? What did you think? Let me know in the comments below!